At The Blind Guy (Kalispell), we have you covered when it comes to custom shutters with three different types of shutters for any preference. Heritance® Hardwood Shutters are perfect for homeowners who prefer plantation style décor. These shutters are crafted from genuine hardwood and use dovetail construction to ensure strength and durability. Hunter Douglas Heritance® shutters are award winning, being named the 2014 product of the year by the Window Covering Manufacturers Association (WCMA). These shutters come in 35 paint colors and stains. 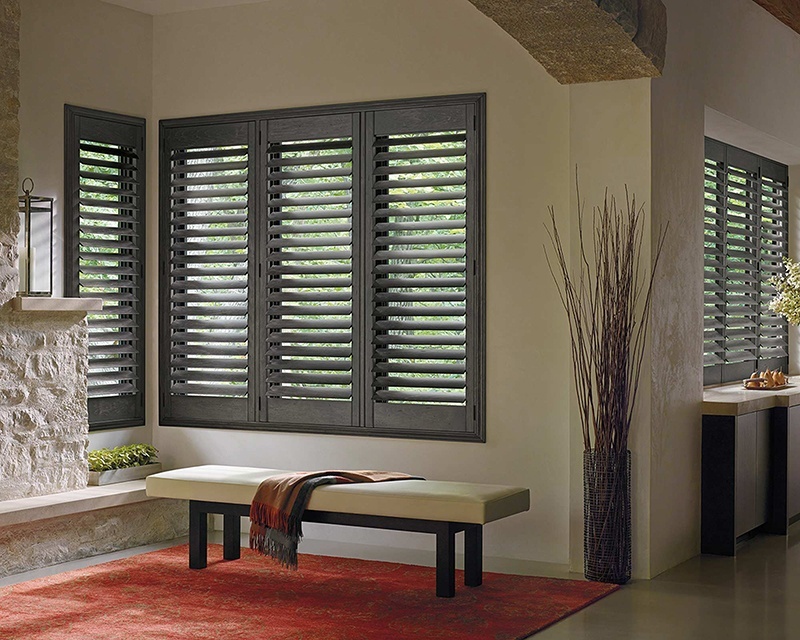 If you have a particular color in mind to match your décor, these Hunter Douglas shutters also come in custom colors. With nine specialty shapes to choose from, these shutters will fit perfectly in almost any home. Alongside these specialty shapes, sunburst or horizontal louvers are available for these custom shutters. Hertiance® hardwood shutters come in five different operating systems: bi-fold track, bypass track, hinged panels, a front tilt bar and TruView™ Rear Tilt. Homeowners have the opportunity to customize these hardwood shutters to their preference from color to operation. Palm Beach™ Polysatin™ shutters combine the look of a finely painted shutter with the strength of a UV-resistant polysatin compound. These custom shutters are perfect for hot and humid climates and are guaranteed to never warp, crack, fade, chip, peel or discolor in extreme heat and moisture. These Hunter Douglas shades come in three polysatin colors, seven specialty shapes and six different operating systems giving homeowners customization control of their shades. NewStyle® Hybrid Shutters combine the look of wood with the strength and straightness of modern-day materials. These Hunter Douglas shades are high-quality, but still affordable, making them the perfect option for homeowners on a budget. These custom shades come in five different operation systems and eight specialty shapes. Homeowners also have the option of two types of finishes: UltraGrain™ or a solid color. NewStyle® Hybrid Shutters allow for customization and affordability, making them the best choice for homeowners who want the best of both worlds. We offer services to the greater Flathead area, including Kalispell, MT; Bigfork, Whitefish and Polson, MT. Give us a call today to schedule an appointment and find your perfect custom shutters.